Hyefighters.com is thrilled to report that one of the most promising Armenian boxing prospects took a giant step towards greatness. 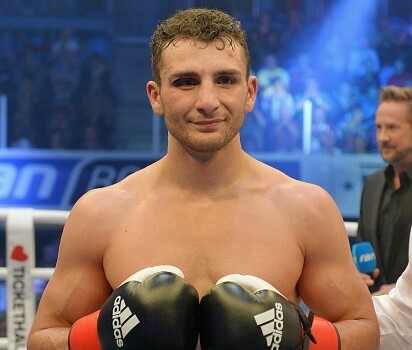 Noel Gevor (Norair Mikaelyan) has captured the vacant WBO International cruiserweight title this past Saturday at the Energie Verbund-Arena in Dresden, Germany. The name is not new to boxing. 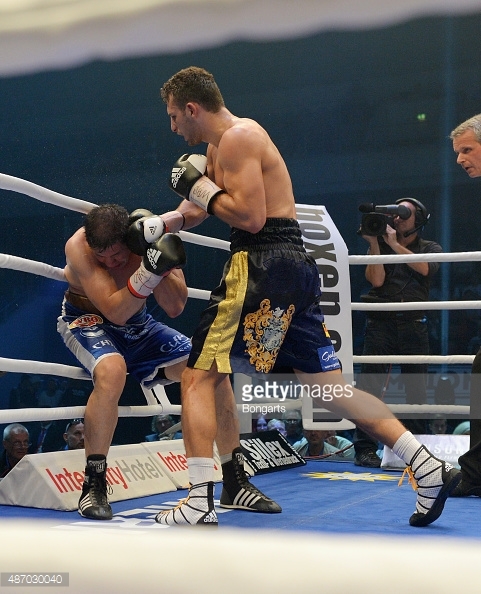 Noel’s stepfather is Khoren Gevor, a hard-hitting middleweight who have repeatedly contended for the world title. This fight found him in the corner, guiding his stepson and student to a UD win over a veteran Argentinian fighter Daniel Alejandro Sanabria. Round 1 began in a traditional explorative way. Early on Noel steadily advanced and worked the levels. About a minute in, he established a degree of dominance, working the body and pushing Sanabria into the ropes. At a minute mark, got a stinging jab in, soon following with a combo to body, which he repeated at 0:20 (each time being quick to get into defensive position when opponent tried to counter). Ended the round with nearly getting through with a snapping left half-hook. Round 2-Sanabria attempts to be more offensive. Gevor stymies attack with a clinch, then unleashes another rapid combo to the body. Manages to keep good distance as Sanabria attacks, looking to counter, and is soon able to do that with a good straight to Sanabria’s face. Soon after, the Argentinian boxer finds himself in a lot of trouble, as Noel pommels him against the ropes with more body hits. He gets out with a charge, for which Noel is well prepared and meets with blocking and dodging, letting Sanabria come forward without doing much damage (save for a grazing body shot), and again counters successfully, displaying impressive quickness and reaction. Gevor connects with a good fast right, and follows with yet another successful attack on mid-section. Sanabria is saved by the bell, as at the end Noel corners him and unleashes a barrage. Round 3-Noel begins it well, testing Sanabria with a fast jab and then getting a body shot in. Undaunted, Sanabria goes on offensive, which Gevor stymies with a clinch and more half-hooks to body. In a lively exchange, both fighters go for big shots, and then Sanabria yet again finds himself against the ropes, absorbing punishment and being forced to cover. Noel repeats this winning strategy again at the minute mark, and follows with a good right straight. Both fighters use clinch to get out of potential trouble. With seconds left, Noel gets in a good quick jab. Sanabria was very aggressive throughout the round, and Noel is left with a black eye and a small cut on the brow after the round is over. Round 4-Fighters exchange at distance, Noel is able to land solid hits, which he followed with more tactical dominance and attacks to body. Sanabria briefly warned for grabbing Gevor’s arms, and then Noel-for accidental hook below the belt. The rest of the round is relatively uneventful, with both fighters exchanging glancing head shots. Round 5-Noel begins the round actively, on offensive early and for most of the first minute. Near the half-round mark, deftly dodges a Sanabria attack and unleashes with a nice combo of his own. Gets Sanabria with a nice pair of jabs. Sanabria gets a jab in seconds before the bell, but Gevor again gets him with body shots against the ropes. Round 6-Begins on a cautious note, with both fighters trading distance shots. 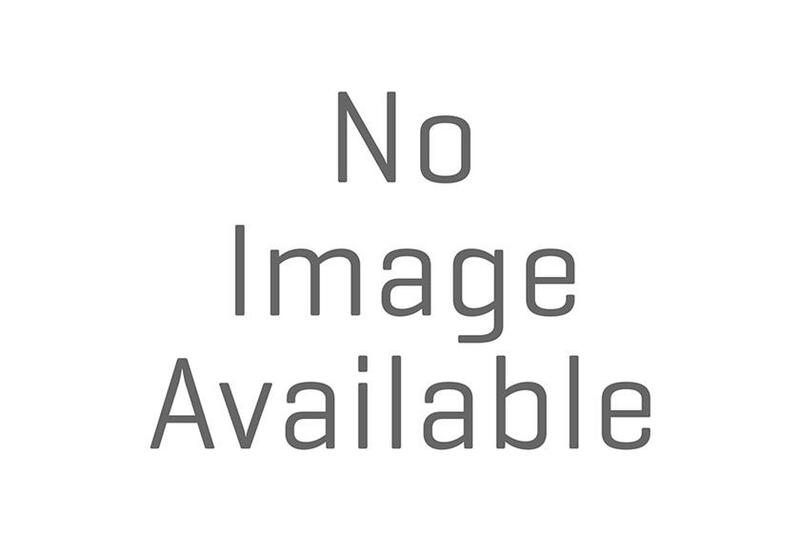 Noel lands repeatedly, while either dodging Sanabria’s attacks or countering effectively. Gets in a strong left to the body, and then pushes Sanabria’s head back with a crisp jab at the minute mark. Sanabria attempts to jab his way in, only to receive a strong left to the face. Round 7-Fighters exchange jabs and then a series of clinches ensues. Again, Sanabria finds himself against the ropes. Noel is able to land a beautiful right overcut, and proceeds with a series of attacks to head, followed by more damage to body. Clearly dominant at this point. Round 8-To his credit, Sanabria persists in attacking, realizing how far behind he is on the scorecard. 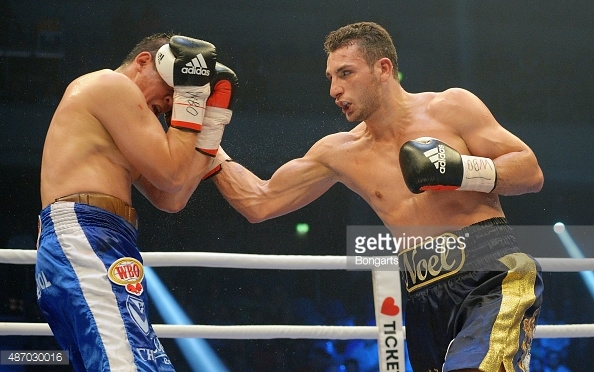 Gevor repeatedly finds mark with jabs. Sanabria eats a few punches and then drops arms, goading Noel to attack. Noel maintains discipline, continuing with a smart ring generalship. After some dancing around, finds mark with rapid jabs. Last half a minute ends uneventfully, save for both fighters accidentally trading shots after the bell. Round 9-Sanabria looks for a miracle at this point, continuously trying to attack. Noel has no problems countering, losing none of his speed of movement. A desperate Sanabria goes for big shots, but gets repeatedly countered by Noel, who also uses timely clinches to break his opponent’s momentum. Round 10-Sanabria attacking with last bits of strength, clearly winded from taking so much damage to body. Noel gets in good head shots half a minute in. A minute in, Noel gets more aggressive and Sanabria is against the ropes again. An outmatched Sanabria nearly gets knocked out near the end as Noel ends the bout on a strong note. A deserved unanimous decision. Noel Gevor demonstrated superior speed, technique, and creativity. His opponent tried stalking and attacking, but more often than not found himself cornered or against the ropes, absorbing punishment. Virtually every round was won by the young HyeFighter, whose record now improves to 19 (10)-0-0. At 24 years of age, Noel finds himself near the top of the rankings, and makes a strong bid for world title contention. Hyefighters.com congratulates Noel Gevor and wishes him further much-deserved rewards.